Product Use : Provides temporary relief of ear pain, minor ear inflammation, stuffiness in ears and swimmers� ear. 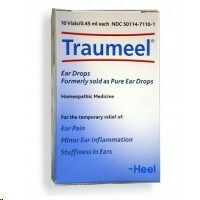 Traumeel (Pure Ear) is a safe, effective, natural remedy ideal for all ages, including children and adults. The inclusion of multiple active ingredients represents the modern approach to homeopathic treatment employed worldwide by Heel. adults and children 6 years and over: Pour contents of 1 vial directly into the affected ear up to 3 times daily. Infants and children under 6 years: pour 1/2 of the contents of 1 vial into the affected ear up to 3 times daily. Each 0.45 vial ml contains: Arnica montana, radix 2X, Belladonna 2X, Calendula officinalis 2X, Chamomilla 3X, Millefolium 3X, Hepar sulphuris calcareum 6X, Symphytum officinale 6X 0.99 mcl each, Aconitum napellus 2X 9.54 mcl, Bellis perennis 2X, Mercurius solubilis 6X 0.495 mcl each, Hypericum perforatum 2X; 2.97 mcl, Echinacea 2X, Echinacea purpurea 2X 0.247 mcl each, Hamamelis virginiana 1X, 0.099 mcl. Inactive ingredients: isotonic saline solution. If symptoms persist or worsen, or if symptoms are accompanied by fever, discharge from ear or dizziness a physician should be consulted.